In New York Times bestselling author J.A. Jance’s timely thriller, Ali Reynolds faces her most controversial mystery yet: the murder of a man whose Ponzi scheme bankrupted hundreds of people, and left them seeking justice...or revenge. When Ali’s parents lose their life savings to a Ponzi scheme, her father goes to confront his longtime friend and financial advisor, only to stumble upon the scene of a bloody double homicide. With her father suddenly a prime suspect, Ali and her husband work to clear his name and seek justice for her parents, as well as the rest of the scheme’s suddenly impoverished victims. But if Ali’s father is innocent, that can mean only one thing: one of the others is a stone cold killer. 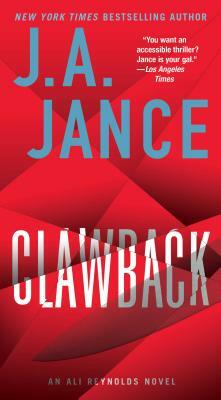 Publishers Weekly promises “series fans will enjoy this highly personal case.” Provocative and gripping, Clawback is further proof that no one writes suspenseful thrillers quite like J.A. Jance.